This is our Windows-based payroll system suitable for all types of business in Southern Africa. abundant reports for the Accountants and Auditors, including an audit trail, and a History file with inquiry facilities, and a general ledger posting with options to interface with well-known accounting packages. importation of information from Excel (or other csv) files, Also exportation of any payroll information into Excel. interface with biometric and other clocking systems. access levels to enable The Payroll Administrator to limit access rights to suitable levels for the operators, auditors, and top management. Human Resource information on training, disciplinary, education and work history. Reports on turnover, retirement and long service. interface with popular Financial software packages. This was our original well-known MS-DOS based payroll. We offered support and limited updates to Version 8 until 31st December 2008 in Zimbabwe, allowing users time to update their hardware and migrate to PayDay. 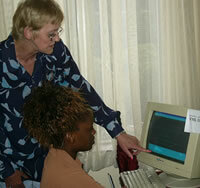 This service was offerred to Botswana users until the end of their fiscal year, June 30th 2009. Payroll Bureau - We offer a confidential and personal service specializing in Executive payrolls. You simply advise us what has changed since the last payday and, within 3 working days, we will do the rest. Our hassle-free service takes away much of the chore of payroll. We process the changes to your payroll – overtime, increases, loan deductions, leave taken etc and ensure the PAYE and other calculations are correct. We send your direct transfer information for your employees' pay via Paynet, if required. We give you details for 3rd party payments, posting for the general ledger, and neat payslips that your employees will find easy to understand. We can now include other useful reports on full cost of employment, and for provisions for leave and redundancy. For some of our clients, we provide a turn-around period of less than 24 hours! We also provide our clients with advice on the Labour Act and Tax requirements. Hot-line telephone support - Our support staff have cell phones and will take your calls even if you are processing your payrolls in the evening, or on the weekend. If you have a problem that can not be solved over the phone, then one of our consultants will come to your office. We make use of Teamviewer to work on-line via the Web on your computer, or you may prefer to bring your hard drive to one of our Support Centres. Payroll training courses and workshops are aimed at improving your payroll staff’s skills and keeping them up-to-date with developments in the payroll environment. Payroll Fraud Seminars for Top Management and Auditors are held several times a year, and can be provided in-house. Advice is given on what to check, and actions to take to prevent payroll fraud within your organsiation. Payroll fraud is often successful because management has not been alert to the possibility. Payroll Health checks (mini audit) - An on-site visit to inspect the overall running of the payroll, examining backup procedures, input controls and authorisations, checking the setup to ensure correct PAYE, CILL and other calculations. A great pre-audit check! Copyright © 2019 Touchstone Computer Systems - Leading Payroll Systems for Southern Africa.